A new version of Microsoft’s Windows 10 preview has been leaked online which reveals Cortana integration and a new Xbox app. Microsoft is currently priming a preview of Windows 10 which will show off its consumer features. The features will be publicly announced at a press event in January, but the new build, dubbed ‘9901′, has been leaked onto the web which gives eager Windows fans a sneak preview of some of the changes. One of the most exciting features is the inclusion of Cortana, Microsoft’s Bing-powered assistant. 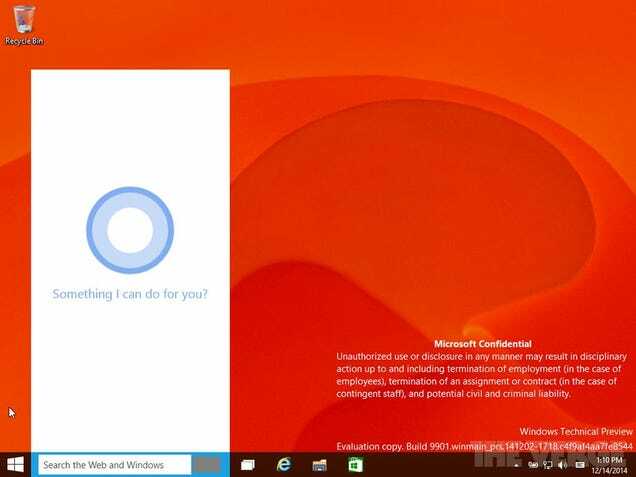 Cortana will be working with the search interface on Windows 10 and obey voice and text commands. An Xbox app is also set to make an appearance on Windows 10. Microsoft will show off the new build officially on January 21 with an event called ‘The Next Chapter’. How much do you know about Microsoft’s Windows Phone? Try our quiz!